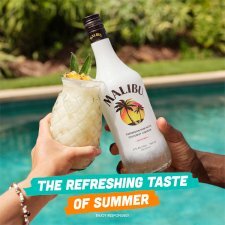 Malibu Original White Rum with Coconut is perfect for when the sun's setting and the good times are flowing. Thanks to its smooth, fresh taste, that sun-kissed island feeling is only a sip away. Malibu rum has a full, rounded lightly toasted coconut aroma and a creamy coconut taste with vanilla custard notes. The body is delicate with a soft warming rum taste and a lasting silky finish. 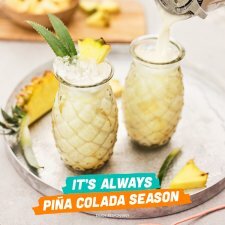 Perfectly versatile and refreshing, Malibu Rum is perfect in cocktails like the classic Piña Colada or mixed simply with pineapple or cola. 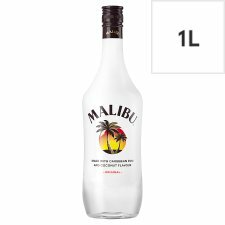 Malibu is the world's number one coconut flavoured rum. The Caribbean rum base is produced at the West Indies Rum Distillery, a world renowned distillery founded in 1893. Every drop is filled with sun, music, beaches, parties, new friends, love, and adventures. Malibu: liberate the spirit of summer. Produced and bottled in the U.K. Serve suggestion: Perfectly versatile and refreshing, Malibu Rum is perfect in cocktails like the classic Piña Colada or mixed simply with pineapple or cola.